Mrs. Hankinson's Class: Math Center Saturday! Yesterday most districts around us canceled or decided early on to dismiss school early due to a snowstorm that was to come through around lunch time. My district, however, did not make a decision until 7:00AM to dismiss early; by the time we left (elementary schools are dismissed first) the snow was beginning to stick to everything! It made for an interesting 30+ mile drive home! Even though it warmed up today and melted everything, I am enjoying a quiet Saturday at home! So ... I have been touching up a couple of my recent math centers and worked on a new one. We have been learning about tens and ones in my class and with this unit, the children need LOTS of manipulatives and games to understand this concept! 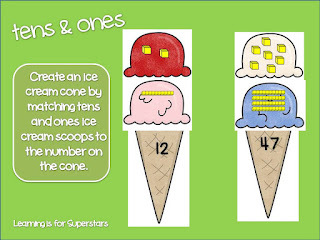 Yesterday we played an ice cream themed tens and ones game. 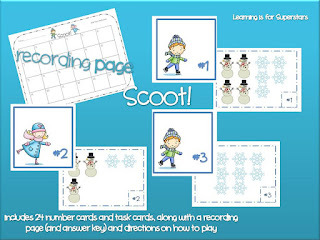 I just added it to my TpT store; click here to get to my store. 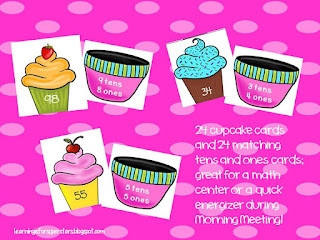 I have also included in my store a bundled unit of 3 tens and ones activities for your classroom. Use whole group or in a center. I have a large class this year, so I think about including all of my firsties when creating new products! If you don't want to use all of them at one time, separate them into different bags. Here's a couple of pictures from the bundle - the ice cream activity from above is also included! Click here or on one of the pictures below to see the bundled unit! 200 Followers - February Freebie! A giveaway and a math freebie for you!